I am feeling more and more like myself and can only attibute it to getting diagnosed early and having had the Shingles shot… but check with your DR as some people are not recommended to have the shot. Ok enough health but it kinda leads into my show and tell of the get well cards I received but FIRST, no not a word from our sponsors as I have no sponsors well my hubby but he has no message. 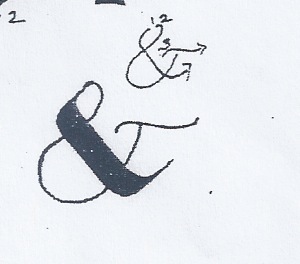 See told you I am feeling better…FIRST I WANT TO SHARE ONE OF MY FAVORITE CASUAL alphabets and YES you can do this even if you never have had any experience with Calligraphy. OK so hope you will enjoy Katherine’s alphabet as much as Nichol and I do. 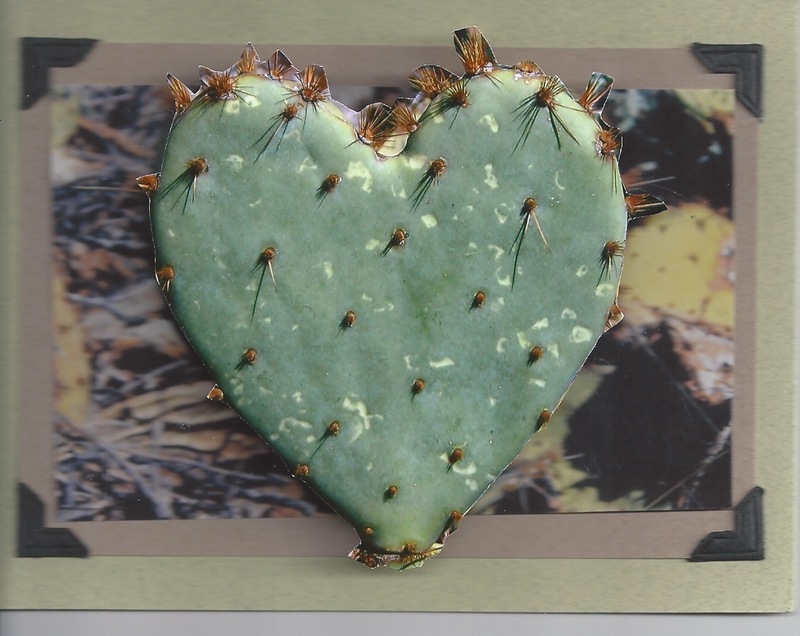 I know I shared another of Sharon’s card where she uses the photo and then makes a second copy of the photo and only cuts out a key element and using foam dots/tape adhere’s to first photo so that it looks so real you feel like you might get poked if you touched it… lol… Thanks Sharon you made my day. 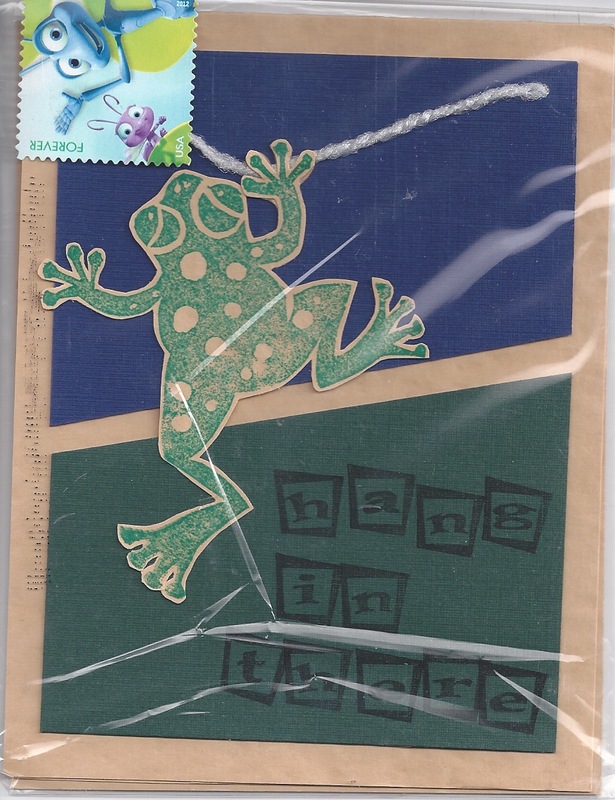 First Janis Blevins made the frog so that he was hanging on the cord and when I took it out of the clear acetate envelope it swung on the cord….toooo clever… and I love frogs so he was the perfect guy for a HANG IN THERE….I have terrific friends. LINDA O’NEILL AND SANDEE FREEMAN’S CARD.. 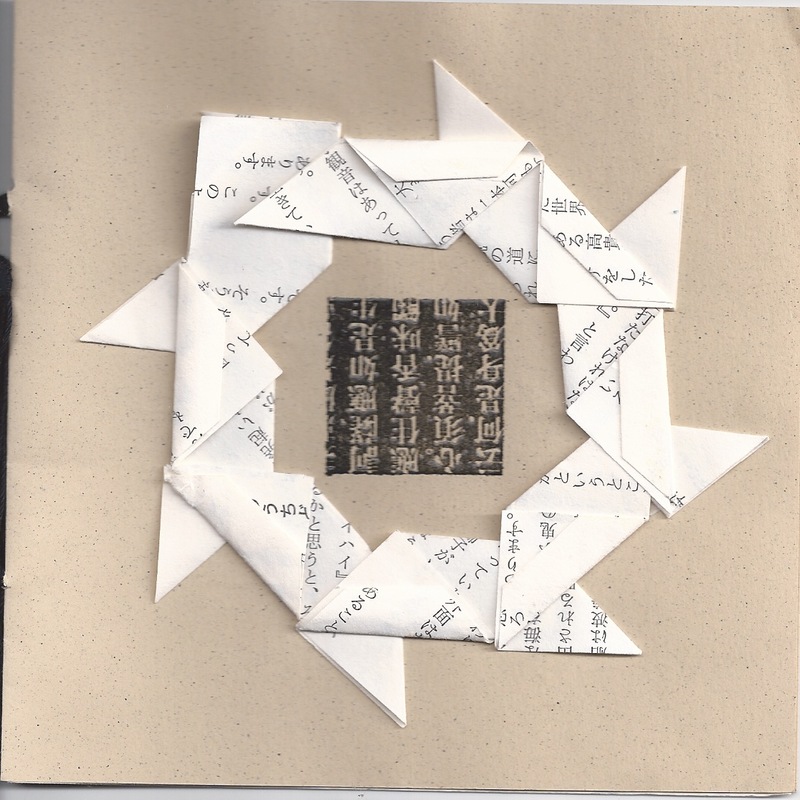 This was a delightful little booklet that was stitched together and had this wonderful origami wreath on the front as well as an asian stamp in the center. I know Linda’s calligraphy group has a lot of card exchanges and I am assuming that since the back of the card said SANDEE FREEMAN she actually made the card BUT LINDA O’NEILL wrote the get well note that was on the signature inside the card. I hope I am giving correct information here but in any case I LOVE ALL THINGS ORIGAMI…so thanks Girls I loved the card. IN fact I loved it so much I figured out how to make the little origami folds so that I could make it too. 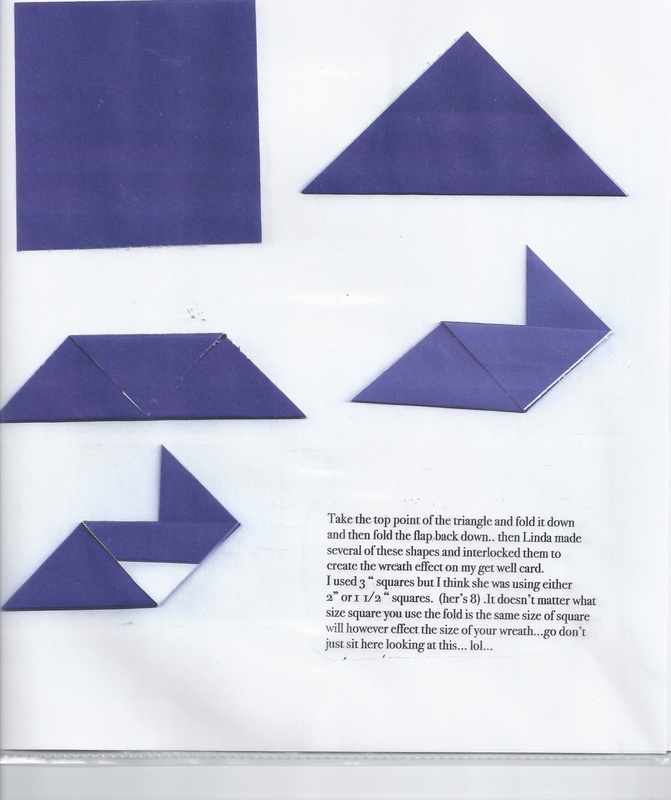 I am guessing but assume that Sandee’s squares were about 1 1/2 ” or 2″ …the ones I used were 3″ but no matter what size square you use the folds are the same…however you would need the smaller squares to make a card that is approximately 5″ square. REMEMBER IF YOU MAIL A SQUARE YOU MUST USE ADDITIONAL POSTAGE. Ok team… hope you will enjoy this script and I’ll post a blog on the Parallel pen next. 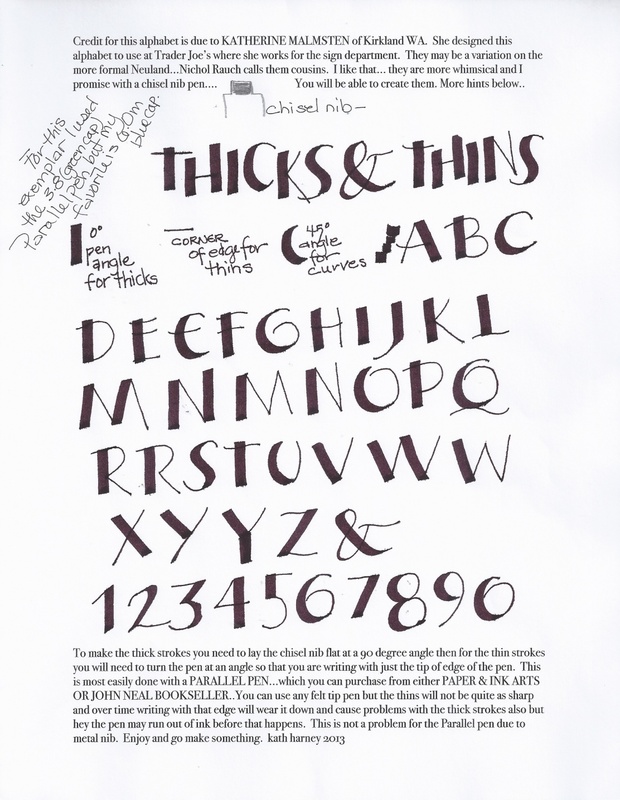 This entry was posted in Calligraphy, Eye Candy, Folding/Origami, Tools by kath. Bookmark the permalink.